To open the Quick Edit window (seen below) for any one product, simply navigate to that product and click on the icon. Part Name: This is the name of your part. Also known as a title. This should be a short description of your item. This will be used to title the detail page for this item. Part No. : Part Number for your item. Every item should have a unique part number or sku# to uniquely identify this item within the system and shopping cart module. The part number is used as part of the URL for this item. If needed you can associated more than one part number with a single item by clicking the 'Add' link to the right of the part number. List Price: This is the normal price of your item. * NOTE: If your item has 'options' (as defined in the 'Part Option' tab, then this price may not be the final price). Also see 'Sale Amount' below. Sale Amount: If the Sale Start/Exp defined in the fields below is within today's date, then this amount will be used to calculate the sale price for this item. You have three different ways to define a sale price. 1) Enter a sale amount, ie. the new total price of this item. 2) Enter a dollar amount to subtract from the 'List Price' above. 3) Enter a % off of the list price listed above. Sale Start/Exp: This is your sale start and end dates. Your sale will automatically begin at 12:01AM of the day specified, and end at midnight of the exp date. Hide Price: Allows you to hide the price of this item on certain pages/displays of this product. The default is 'Disabled' in which case the price will be shown anywhere it is defined to do so. Hide Price Msg: (Optional Message) when hiding a price you can optional choose to display some text saying why. For example you may want to simply say 'Click for more Pricing Details'. Quantity: This is the quantity on hand for this item. This has no bearing on if the item can be purchased unless a custom template is provided. Quantity Text: This is helper text that will be placed next to where the user enters their qty they wish to purchase. You can use this to clarify what they are getting, for example you could enter "1 Set of 4" if entering "1" gives them the "Set" of 4 items. Sort Code: This is a hidden override to the natural search ordering. By default most searches will return in Alphabetical order. This allows you to move an item to the top of the list without having to change it's name. Numeric numbers come first, then Capitol Letters, then lower case letters. Keywords: This is a place to enter additional keywords for this item. This field is searched in addition to the normal Part Name field when the user enters a search (or you create a custom search for the users). This field is never seen by the ender user. This allows you to enter in custom search strings, common misspellings that will still return results for the user. Suggested Title: This is a optional custom 'title' for any items listed in the field below that we call 'suggested' items. Suggested Items: This is a optional list of part numbers that you want to 'Suggest' to the end user. This should be a comma list of part numbers ie (part123,part345,part566). These items will appear below an item when viewed on it's detail screen view. Availability: The status of the item as it's ability to be purchased or seen by the end user. If this item is 'unavailable' for purchase, but you still want it to be found by the end user, then set this option to 'Purchase exempt'. Of you want to take this item off-line, then set this option to 'offline' and this item will not show up on page/searches by the end user. 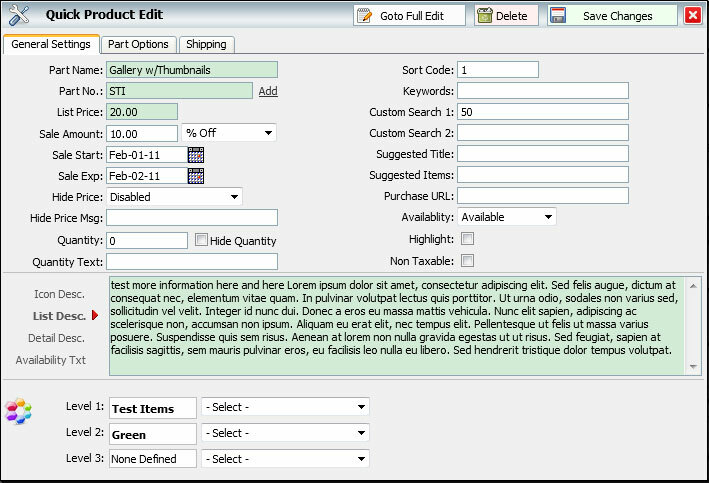 Highlight: This is a quick toggle to allow grouping of special items for a teaser page, product line or info page. Non Taxable: If this item should always be non-taxable, even if purchased within the same state, then toggle this on. List Desc. : This is your product's main description. Here you should have all the detail of for your item. In some template setups, you may want to use separate Icon/List/Detail descriptions (some being longer or shorter than others). If this is the case it would be pre-determined for you site and you would know about it. If you're unsure then all you need is the "List Desc" for everything. Availability Txt: When you've toggled this item as 'Puchase Exempt' you can optionally tell the user why this item can not be purchased in this area. If this is blank then the system will use a default message, as defined in your site settings. Categories: At the bottom are the categories defined for this item. Each site varies, so you may have anywhere from 1 to 6 categories listed here. You can define a new category on the fly by selecting 'new category' and enering a new category name. An item can be in multiple categories at the same level. To remove a category, hover your mouse over the category name you wish to remove, a red "X" will appear that you can click on to remove this part from that category. Once a category is defined, you must go to the main Category Administration to delete it.